It is a well-known fact that in the United States Navy as well as in the Royal Navy and French Navy all combatant submarines are nuclear-powered. At the same time as Russia, China and India operate not only nuclear-powered submarines, but also diesel-electric submarines. There are some sophisticated models among modern diesel-electric submarines. I reckon the most advanced subs of that type are Sōryū-class attack submarines (Japan) and Type 214 class submarines (Germany). Sōryū-class submarines are fitted with air-independent propulsion based on Kockums stirling engines license-built by Kawasaki Heavy Industries, allowing them to stay submerged for longer periods of time. Therefore, I am not surprised that Australian officials are leaning towards replacing the Collins-class submarine with Sōryū-class boats bought from Japan. Apparently, France is going to return to the club of diesel-electric submarines. As naval-technology.com reported, SMX-Océan, a conventionally powered attack submarine design concept, unveiled by DCNS Group, is based on the basic Barracuda-class nuclear submarine layout including weapons, masts and combat system. The SMX-Océan submarine will be a transposition of the Barracuda SSN nuclear powered attack submarine into diesel-electric submarine (SSK). It is expected to enter into French Navy’s service by 2017. The new multi-role submarine will be suitable for deployment in anti-surface warfare (ASuW), anti-submarine warfare (ASW), anti-air warfare (AAW), land attack and even Special Forces missions. Special operations forces (SOF) equipment for 16 divers will be fitted to the sub, as will an internal reserved area, lock out chamber for eight divers, and an external watertight storage. It will also feature a dry dock shelter, hyperbaric chamber, swimmers delivery vehicle, and unmanned underwater vehicle (UUV) dock. 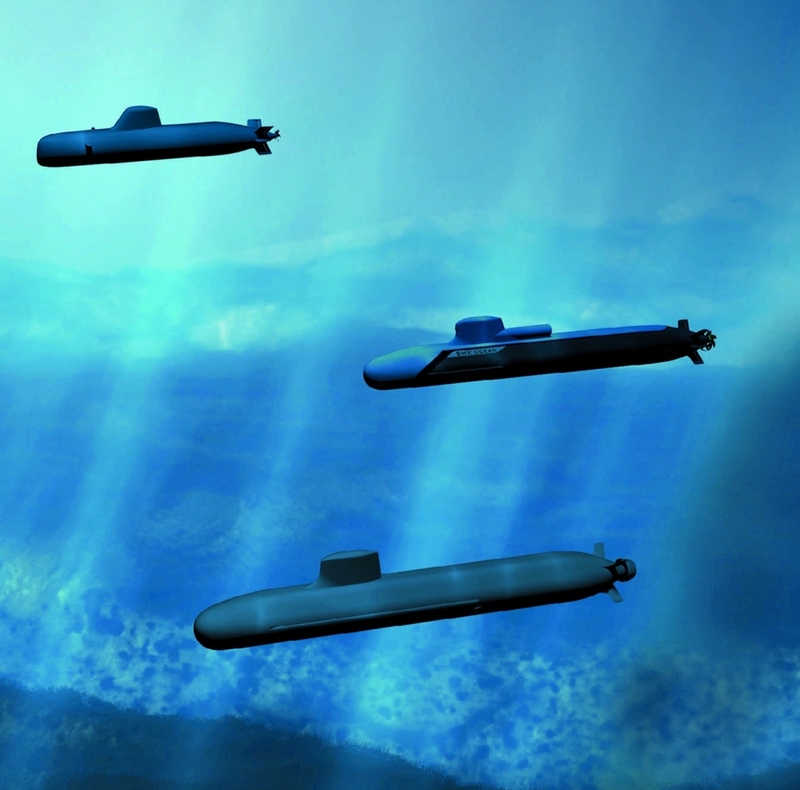 The SMX-Océan submarine will integrate sensors with manned or unmanned vehicles that provide capability to gather intelligence in four domains including air, surface, under the sea and on the land. It will be capable of launching UUVs and unmanned air vehicles (UAVs). With up to three months’ endurance, an SMX-Océan could cross the Atlantic six times without surfacing. DCNS teams have developed and combined a number of innovations including a high-performance air-independent propulsion (AIP) system using second-generation fuel cells for submerged endurance of up to three weeks (21 days). With a total of 34 weapons including torpedoes, mines, anti-ship missiles, cruise missiles and anti-air missiles, the SMX-Océan’s firepower will be unprecedented for an SSK. The SMX-Océan concept design also includes vertical launchers to provide a salvo capability for cruise missile strikes on land targets. 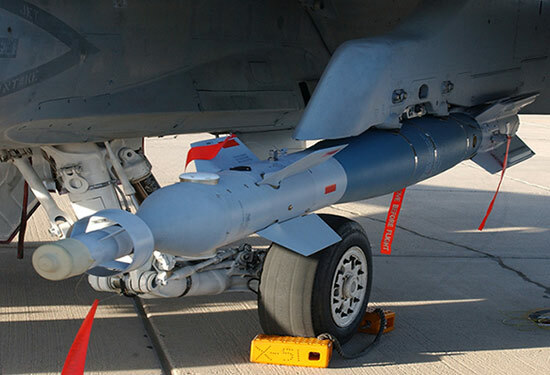 According to the Jane’s (IHS Inc.), the Royal Air Force (RAF) has completed the first in-service releases of the Raytheon Paveway IV precision-guided bomb from a Eurofighter Typhoon. 1(Fighter) Squadron, based at RAF Lossiemouth, successfully released two live Paveway IV weapons at Cape Wrath Training Area on 25 November as part of the squadron’s work up with the new Phase One Enhancement (P1Eb) Typhoon capability upgrade. The squadron conducted a total of eight Paveway IV drops during the week of 24 November, with a mix of profiles including GPS and laser guidance; pre-planned and target of opportunity using the pilot’s Helmet Equipment Assembly (HEA); and employing both impact and airburst fusing settings on the weapon. The eagerly awaited P1Eb upgrade brings full air-to-surface capability for the Tranche 2 aircraft. It provides enhancements to the Litening III Laser Designator Pod (LDP) and the HEA as well as with Paveway IV. The LDP can now also be used seamlessly with the HEA to visually identify air tracks at long range, as well as identifying, tracking and targeting points on the ground. The Paveway IV offers increased precision, stand-off, and flexibility of employment, and the Typhoon can release a number of weapons to different targets in a single pass. BAE Systems test pilot Steve Formoso commented, «P1Eb standard Typhoons can carry up to six Paveway IV weapons, which can be released simultaneously against multiple targets». 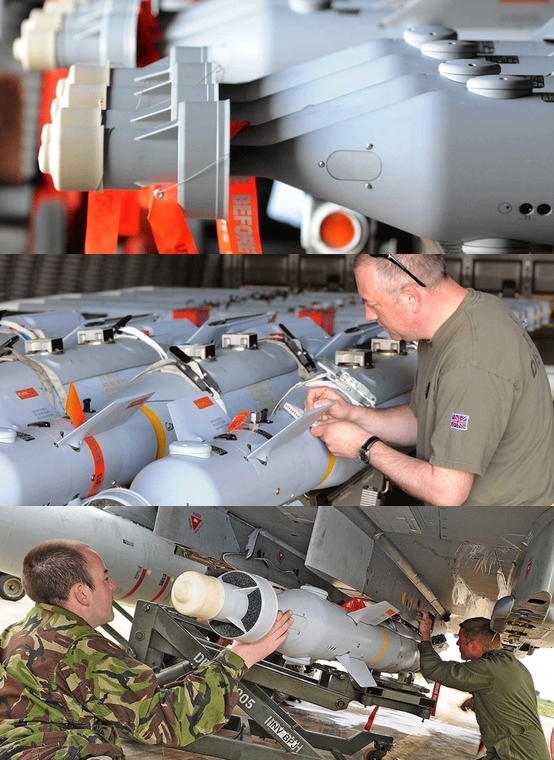 Manufactured by Raytheon Systems Ltd, UK, Paveway IV dual-mode (INS/GPS and laser-guided) precision guided bomb significantly increases the RAF’s capability to deliver precision effects matched to the target set. The weapon is cockpit-programmable and allows the aircrew to select weapon impact angle, attack direction and fuzing mode to detonate in airburst, impact or post-impact delay modes. The fuze minimizes collateral damage through the ability to detonate the weapon when buried or partially buried, and is fitted with a ‘Late-Arm’ safety functionality that will not allow an off-course munition to arm. The company has also developed a penetrator warhead for the Paveway IV, through which Raytheon is aiming to provide roughly the same level of capability as a 2,000 lb penetrator in a 500 lb package. To achieve this, the warhead incorporates an inner hardened-steel penetrator surrounded by a frangible peeling shroud, operating on the same principle as a sabot round to provide a higher sectional density and reduced impact area to improve penetration. The lighter Paveway IV’s provides greater flexibility giving the potential for a single aircraft to carry more weapons and so strike multiple targets in a single pass. The weapon can be reprogrammed with target data by the aircrew while airborne by using data from on-board sensors or from Forward Air Controllers on the ground. Paveway IV also retains the legacy laser guidance capability of its predecessors. Other improvements over older weapons include less drag, greater accuracy, higher resistance to GPS jamming, better supportability, zero maintenance, lower cost and improved safety signatures. The weapon went straight onto an operational footing after its introduction into service being carried by Harrier GR9 in Afghanistan. It was later integrated onto Tornado GR4 with outstanding success on missions in both Afghanistan and Libya. Paveway IV is also a candidate weapon for integration into Joint Combat Aircraft. While the Ukrainian project of Antonov An-70 is still lacking funding, the European Airbus A400M Atlas is gaining momentum. As UK Ministry of Defence reported, the first of the UK’s A400M Atlas aircraft has been officially unveiled at its new home at Royal Air Force (RAF) Brize Norton. The aircraft will replace the existing fleet of C-130 Hercules (http://usairforc.blogspot.ru/2014/11/c-130j-super-hercules.html). Manufactured by Airbus Defence & Space, A400M Atlas will represent major advances on its predecessor, capable of flying almost twice as fast, twice as far and carrying almost twice as much cargo. With a cargo capacity of 32 tonnes and a hold optimised for carriage of heavy vehicles, helicopters or cargo pallets, the aircraft is capable of supporting a wide range of operational scenarios. The UK is the third country to operate the aircraft, after France and Turkey and the £2.8 billion programme will see a total of 22 aircraft delivered to the RAF in the coming years, as it was reported by defense-aerospace.com. The A400M has been rigorously designed to meet the equipment transport needs of modern armed forces. The A400M can perform missions, which previously required two – or more – different types of aircraft, and which even then provided an imperfect solution. Its fuselage external width of 5.64 metres/18 ft 6 in is equal to that of the A330/A340 wide-body. Its cargo hold has an inside usable width of 4 metres/13ft, height of up to 4 metres/13ft, and usable length of 17.71 metres/58 ft.
Extensive use of advanced 3D computational fluid dynamics tools optimised the wing shape, resulting in a low drag design and thus a high speed cruise of Mach 0.72, without compromising low speed performance and handling. 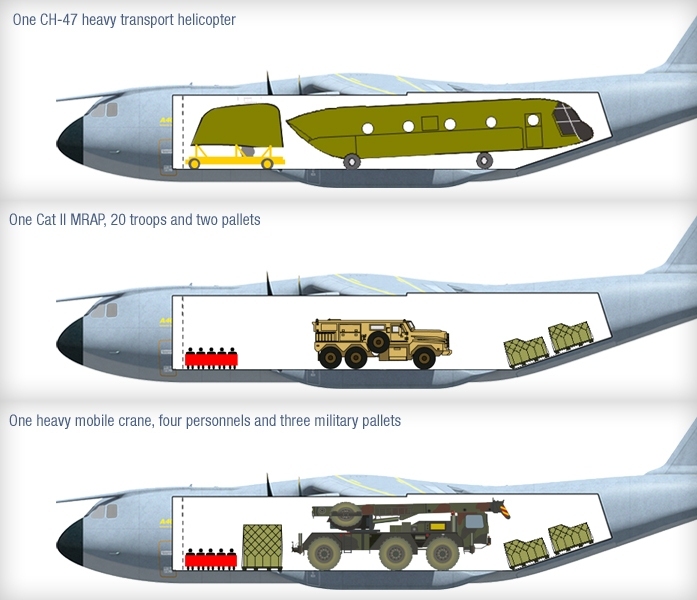 With a maximum payload of up to 37 tonnes (81 600 lb) and a volume of 340 m3 (12 000 ft3), the A400M can carry numerous pieces of outsize cargo including, vehicles and helicopters that are too large or too heavy for previous generation tactical airlifters, for example, an NH90 or a CH-47 Chinook (http://usgroundforces. blogspot.ru/2014/11/ch-47-chinook.html) helicopter, or two heavy armoured vehicles for military purposes. It can also carry a heavy logistic truck, or a rescue boat, or large lifting devices, such as excavators or mobile cranes needed to assist in disaster relief. The A400M is able to land on, and take-off from, any short, soft and rough unprepared CBR 6 airstrip, no longer than 750 m/2,500 ft, while delivering up to 25 tonnes/55,000 lb of payload, and with enough fuel on board for a 930 km/500 nm return trip. In addition to offering optimised support to deployed military operating bases, these characteristics also allow it to ensure that swift humanitarian aid can be deployed direct to a disaster region. The A400M can also easily and swiftly be adapted to become a Tanker, if required in a military operation. Air-to-Air Refuelling can be done either through two wing mounted hose and drogue under-wing refuelling pods or through a centre-line fuselage refuelling unit (FRU). Its built-in air-to-air refuelling capability allows it to be rapidly re-configured to become a tanker. With hard points, fuel lines and electrical connections already built into the wings, it takes under two hours to convert the A400M from an airlifter into a two-point tanker aircraft. 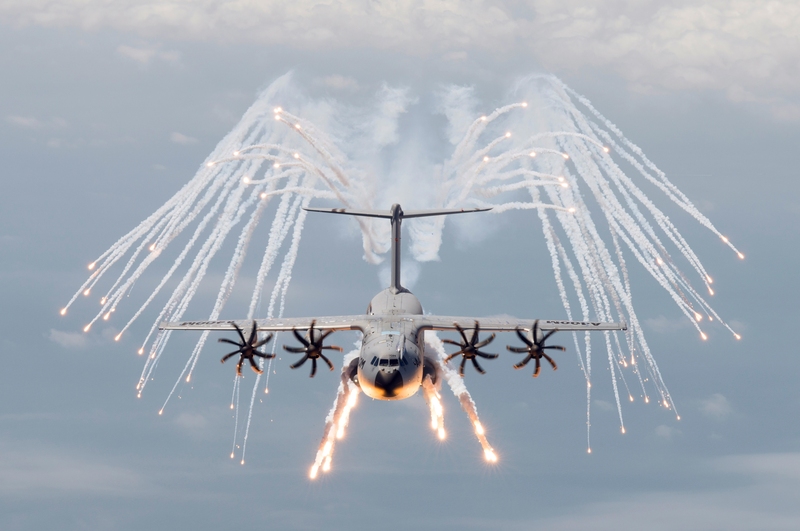 The A400M excels in the airdrop role, being able to drop from both high and low altitudes, (as high as 40,000 ft for special forces’ operations, and as low as 15ft for low level load deliveries). With the new A400M, which can carry more paratroopers than other Western-built military transport, Airbus Military is setting new standards in paradropping operations. It is not a secret of the Universe our World is changing. After the Russian-Georgian and Russian-Ukrainian war, NATO revised its understanding of Russia. Moscow made no secret of his ambition with regard to its neighbors. Thus, the United States understood the need to maintain amphibious fleet in a constant state of readiness to be able to move troops in Europe. LPD Flight II, Huntington Ingalls Industries, Inc.
As said Sam LaGrone, the USNI Online Editor at the U.S. 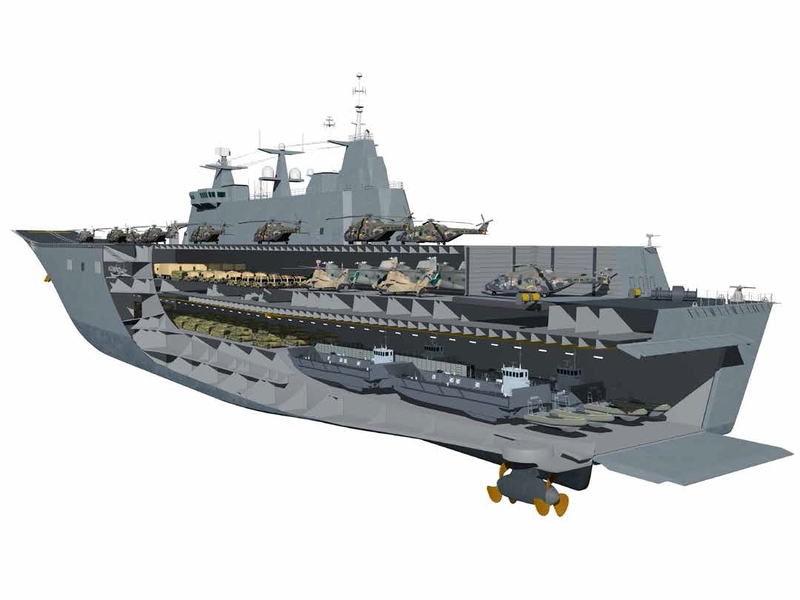 Naval Institute, Huntington Ingalls Industries (HII) has revised its plan to use the hull form of the San Antonio-class amphibious warship (http://navyarm.blogspot.ru/2014/11/san-antonio-class-lpd.html) as a candidate for the Navy’s next generation amphibious warship – LX(R). HII’s new Flight IIA modifies the original LPD-17 design by removing some of the higher end capabilities of the San Antonio and creating a so-called amphibious truck to replace the existing class of aging Whidbey Island (http://navyarm.blogspot.ru/2014/11/whidbey-island-lsd.html) and Harpers Ferry (http://navyarm.blogspot.ru/ 2014/11/harpers-ferry-class-lsd.html) 16,000-ton landing ship docks (LSD). The current LSDs have a minimal command and control capability – the ability to communicate with other U.S. military forces and coordinate different types of aircraft and smaller vessel – and no native ability to host and maintain the aircraft of the trio of ships that make up the Navy’s Amphibious Ready Groups (ARGs). 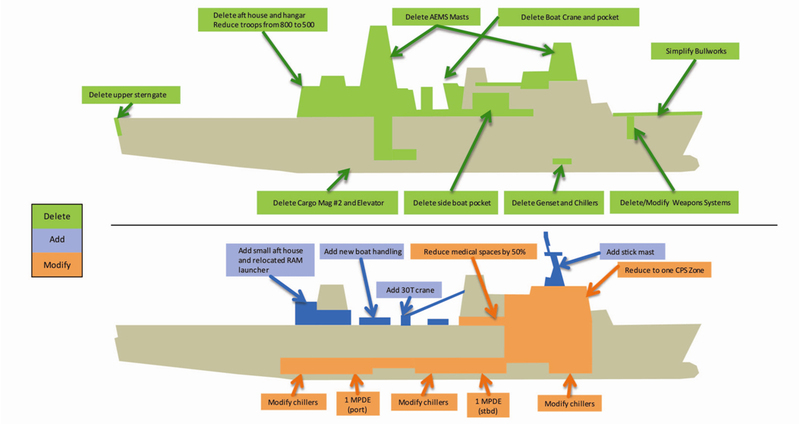 The LX(R) will be much bigger than the ships it will be replacing – displacing about 7,000 more than the current LSDs at 23,470 tons, HII officials told USNI News. The Mark-46 30mm gun weapon system is replaced with a Mark-38 Mod 2 remote controlled 25mm chain gun providing offensive and defensive ability. The AN/SPS-48E air search radar is replaced with a TRS-3D, which is currently outfitted on the National Security Cutter providing a more suitable sensor for its mission. The Flight IIA retains about half of the medical spaces on the LPD. Company officials also said the current iteration would feature two spots for the Navy’s LCAC hovercraft or one utility landing craft (LCU) – which is in line with the Navy’s current thinking for requirements for the LX(R). Other changes include reducing the troop capacity from 800 to 500 with a crew of about 400 sailors. Though HII is original designers and builders of the LPD-17 ships, they are not guaranteed the design and construction contract for the new LX(R) ship class. General Dynamics NASSCO in San Diego, California has also helped the Navy in its current push to lower the cost at the start of the acquisition process and is considered likely to bid on the final work. The Navy’s frontend analysis of alternatives process for LX(R) has been described as, «the best ship design conversation we’ve had in a long time inside the government», NAVSEA chief Vice Adm. William Hilarides said in May. HII officials didn’t announce a cost estimate for their version, but according to past information from the Navy a San Antonio LX(R) could cost about $1.64 billion for the lead ship with follow-ons costing about $1.4 billion for a total of 11 ships. Canberra’s Commander Air, Commander Paul Moggach, told IHS Jane’s that the Royal Australian Navy (RAN) commissioned first-of-class landing helicopter dock HMAS Canberra in Sydney on 28 November. Thus, the sealift capability of the RAN has been dramatically increased. Based on the design of the Spanish Navy’s aircraft carrier Juan Carlos, the Canberra can embark, transport, and deploy more than 1,000 troops and their equipment from alongside or by helicopter and landing craft. 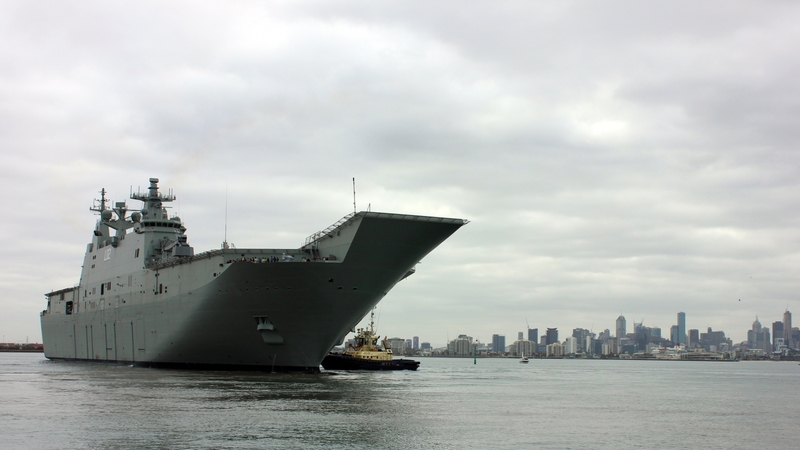 Canberra will be joined in 2016 by sister ship HMAS Adelaide (LHD 01). 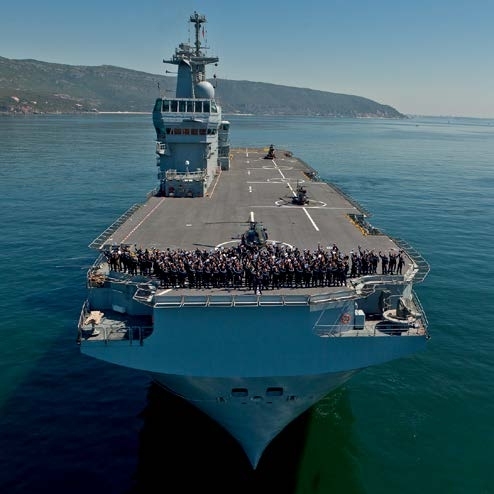 The hulls of both ships were constructed by Navantia at its Ferrol facility in northwest Spain and subsequently transported by heavy-lift ship to BAE Systems in Melbourne for addition of the superstructure, fitting out, and systems integration. Design changes for the RAN included upgrades to air conditioning, Australian explosives standards in the magazines, enhanced firefighting and medical facilities, and four Typhoon remote-controlled 25 mm weapons systems at each corner of the hull for close-in defence. The Australian-developed Nulka hovering anti-missile decoy will be fitted at a later date. The flight deck is configured for simultaneous operation of four medium-sized helicopters, such as the NHIndustries NH90 (MRH90 in Australian service) or the Sikorsky S70A-9 Black Hawk, or four Boeing CH-47D/F Chinooks. Up to eight medium helicopters can be accommodated in the hangar, and up to 18 can be carried if the light vehicle deck is also utilised. The four Navantia-built LCM-1E watercraft carried by each LHD can transport a maximum load of 54 tonnes via the ship’s well deck. The ultimate goal of these efforts – an Amphibious Ready Group: a battalion-based combat team with enablers that will involve about 2,000 troops and require both LHDs to transport – is scheduled to be operational by 2017. Initial operational capability (IOC) for Canberra is expected to be reached in 2016, enabling the ship to participate in that year’s Rim of the Pacific (RIMPAC) exercise. Earlier this year Prime Minister Tony Abbott ordered an assessment of the benefits of the F-35B short take-off and vertical landing (STOVL) variant of the Lightning II Joint Strike Fighter and modifying the LHDs to operate them. 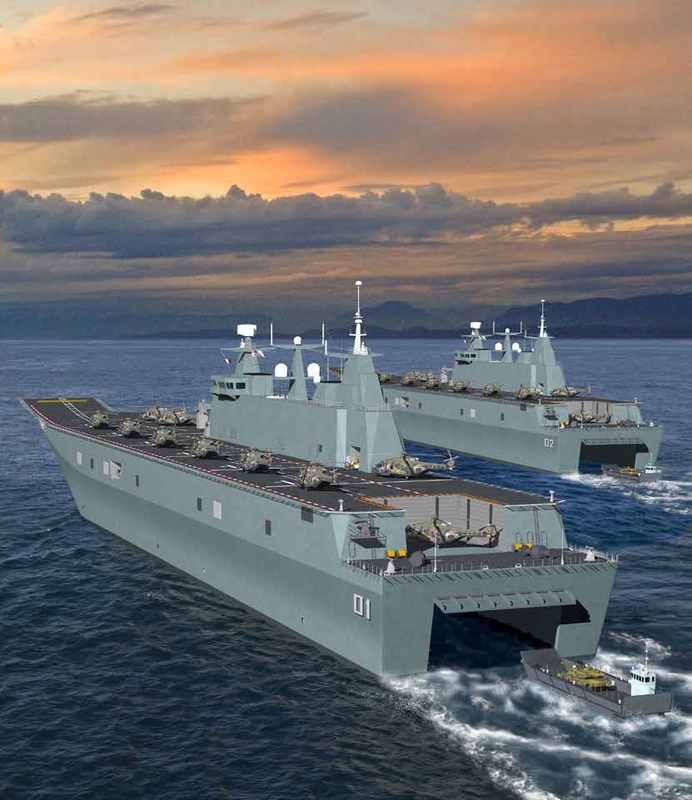 Unfortunately, the general reaction from senior defence sources of the Royal Australian Navy has been that additional capability would not be justified by the time, cost, and risk involved. As it is known from open sources, the fourth American warship named for the United States of America – USS America (LHA-6) can fulfill battle missions when configured with 20 F-35B strike fighters. USS America has been modified to make her better able to withstand the great amounts of heat generated by the F-35B’s engine exhaust when taking off or landing vertically. Intercostal structural members will be added underneath flight deck landing spots seven and nine to more closely perform timed cyclic flight operations without overstressing it. Other changes may involve re-adjusting some ship antennas to allow for a clear flight path. From this, we can conclude that it is not so easy to accommodate aircraft carriers like Australian HMAS Canberra (LHD 02) or Japan Izumo (DDH-183) for using with new multirole fighter F-35B Lightning II. The Boeing P-8 Poseidon is an anti-submarine warfare and anti-surface warfare aircraft developed for the United States Navy. Nevertheless, the US Navy is not a unique operator of that powerful aircraft. India renamed P-8 Poseidon into P-8I Neptune. Ironically, Poseidon (Greek: Ποσειδῶν) was one of the twelve Olympian deities of the pantheon in Greek mythology. His main domain was the ocean, and he was called the «God of the Sea». The name of the sea-god Nethuns in Etruscan was adopted in Latin for Neptune in Roman mythology; both were sea gods analogous to Poseidon. So why in India sailors prefer Roman mythology Greek? I have no idea. 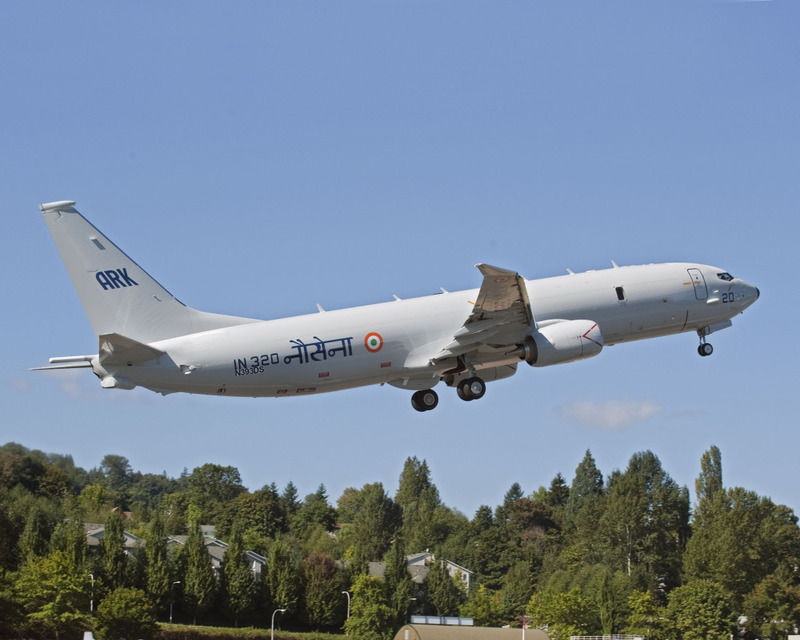 Notwithstanding, Boeing has delivered the sixth P-8I Neptune to the Indian Navy, the company announced in a statement on 25 November, as IHS said. The aircraft was said to have arrived at Indian Naval Station (INS) Rajali in Arakkonam (southern India) on 24 November. It joins five other P-8Is already being used by the Indian Navy and is scheduled to begin flight trials «in the coming months», according to the statement. 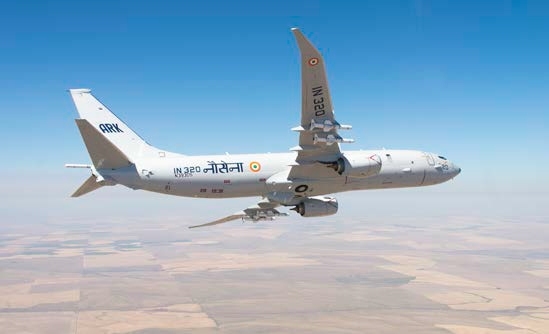 The latest P-8I delivery is part of an eight-aircraft contract worth USD2.1 billion awarded in January 2009 to replace India’s ageing Russian Tupolev Tu-142Ms. The first aircraft was handed over to the Indian Navy in December 2012; the final two are scheduled for delivery in 2015. The P-8I Neptune is based on Boeing’s 737 commercial aircraft, and can accommodate a crew of nine including five mission system operators. The aircraft has an operating range of more than 2,000 km with a four-hour on-station endurance. The aircrafts are equipped with Raytheon’s APY-10 surveillance radar that incorporates air-to-air, air-to-sea, and all-weather modes. According to an IHS Jane’s report in May 2013, the aircraft are also armed with Raytheon’s AGM-84L Harpoon Block II anti-ship missiles and Mark-54 torpedoes for submarine prosecution. Accordingly, India shows its serious ambitions for its military presence in the Indian Ocean. 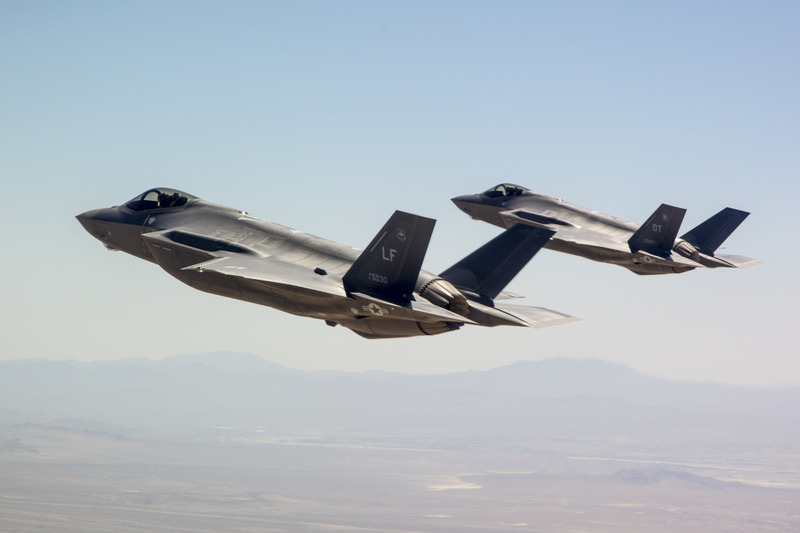 As defense-aerospace.com reported, the U.S. Department of Defense and Lockheed Martin finalized the eighth F-35 Low Rate Initial Production (LRIP-8) contract for 43 F-35 Lightning II airframes valued at $4.7 billion, including $0.5 billion of Advance Procurement funding that was announced at the time of award. The 43 F-35 include 29 jets for the United States and 14 for five international countries. This agreement reflects an average airframes unit cost approximately 3.5% lower than the LRIP-7 contract signed in 2013 and a 57% reduction since LRIP-1. Furthermore, the LRIP 8 contract provides for the production of the first 2 F-35A for Israel and the first 4 F-35A for Japan, along with 2 F-35A for Norway and 2 F-35A for Italy. The United Kingdom will receive 4 F-35B (STOVL). The contract also funds manufacturing-support equipment as well as ancillary mission equipment. 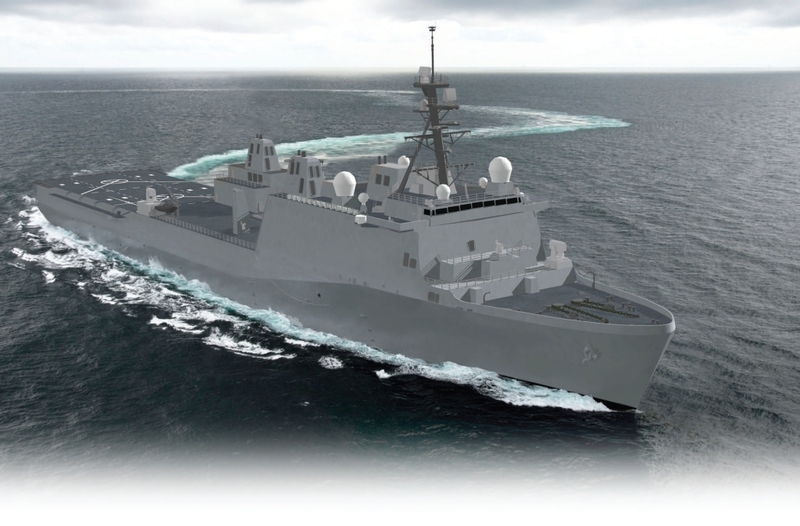 Lockheed Martin will begin delivering LRIP 8 units in early spring 2016. Once production of LRIP 8 aircraft is completed, more than 200 F-35s will be in operation by eight nations. Thus, as a result of American allies will be able to explore new sophisticated stealth machines and test them in real conditions. I guess the United Kingdom is the most interested operators of all allies to the F-35 contract. By the way, Gareth Jennings (IHS, London) says the UK already has two operational test and evaluation (BK-1 and BK-2) and one training aircraft (BK-3) delivered and flying out of Eglin Air Force Base in Florida (USA). The order of 4 F-35B marks an initial buy from the MoD’s Main Gate 4 acquisition approval process for 14 jets to equip the Royal Air Force’s (RAF’s) 617 Squadron, which is scheduled to stand-up as the UK’s first operational F-35B unit in 2016. In 2018, 617 Sqn will transfer to its future home station at RAF Marham in the UK, and in December of that year the UK will declare initial operating capability – land (IOC – Land) for its F-35B force. The second unit – the FAA’s 809 ‘Immortals’ Naval Air Squadron – will be created ahead of the commencement of sea trials aboard the future HMS Queen Elizabeth aircraft carrier in 2018, with the full operating capability (land and maritime) being declared in 2023. 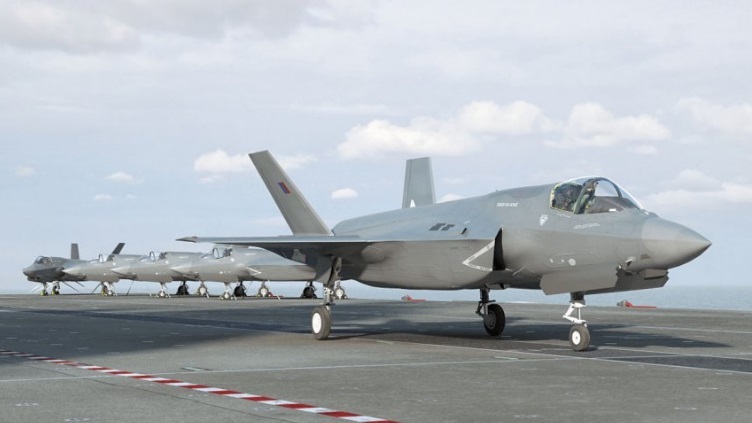 The exact numbers of aircraft are yet to be decided, but with the UK having so far committed itself to just 48 F-35 it is likely that the final order will be substantially less than the 138 programme of record. As you could hear, the famous soap opera «Mistral and Putin» continues with a new intriguing accompaniment. On November 25, the Reuters reported, France suspended INDEFINITELY on Tuesday delivery of the first of two Mistral helicopter carrier warships to Russia, citing conflict in eastern Ukraine where the West accuses Moscow of fomenting separatism. 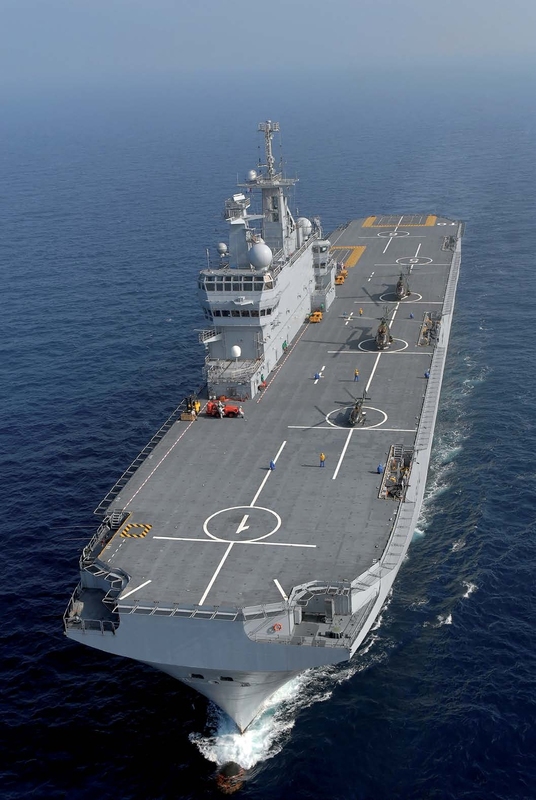 «The President of the French Republic considers that the situation in the east of Ukraine still does not permit the delivery of the first LHD (helicopter carrying and command vessel)», said a statement from President Francois Hollande’s office. «He has therefore decided that it is appropriate to suspend, until further notice [when Hell freezes over], examination of the request for the necessary authorization to export the first LHD to the Russian Federation». Russia will not receive the first Mistral (Russian sailors named him «Vladivostok») in the nearest future, I mean, in December of this year. What was the purpose of this deal? Why Russia wants to spend more than €1.2 billion for the purchase of ships, which she would never be able to use? Because Russia has a common land border with all «enemies», such as China or Ukraine. This is the billion-dollar question. By the way, if you are interested in comparison Mistral with the American amphibious assault ships, you could see general technical specifications of some LHA and LHD in my navy blog (http://navyarm.blogspot.ru/). I suppose, Russia has no chance to prevail in this direct comparison with the US Navy.